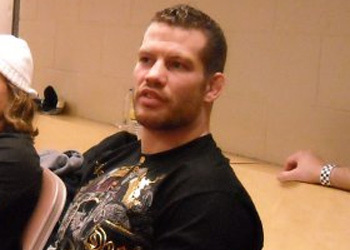 The UFC doesn’t have room for Jake Shields on its roster, but Nate Marquardt (pictured), who is in the midst of a three-fight losing skid, gets to headline the UFC’s debut in New Zealand. On Monday, UFC officials announced “Nate the Great” will meet James Te Huna on June 28 inside Vector Arena in Auckland. The event, which goes down the same days as the UFC’s show in San Antonio, will be made available via UFC Fight Pass. Marquardt has dropped five of his last eight scraps, with his most recent defeat coming in October’s KO to Hector Lombard. It is believed the 34-year-old will once again be fighting for his UFC life. Speaking of skating on thin ice, Te Huna has lost two consecutive tangos. He was knocked out by former light heavyweight champ Mauricio “Shogun” Rua in December and submitted by Glover Teixeira before that.